Diddy Kong Pilot: 2001 Alpha has been Released!!! Breaking news! 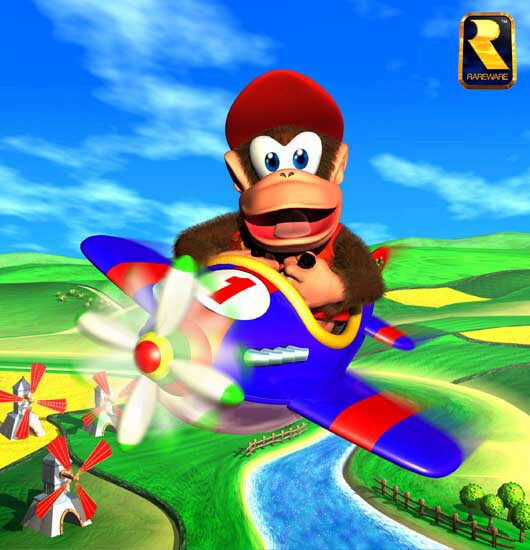 The Diddy Kong Pilot 2001 Alpha ROM has been released! Get the 2001 alpha here! So anyway, you can see an early build of Diddy Kong Pilot. It is completely different from the finished product Banjo-Pilot, and from the looks of it, it had so much potential. It is a very different game from Banjo-Pilot was: For example, the courses are entirely different, where the layouts are unrecognizable, and they are graphically different too (arguably better, even if they still suffer from the brightness problem that every Rare game has), although one level sorta looks like Hailfire Peaks. Some courses are unfinished, however, which have placeholder graphics. This is an alpha, so you can't expect it to be complete, obviously. The menus are also very different from Banjo-Pilot as well, and so is the title screen. It just has a completely different feel to it. The title screen is the only screen that has music, and it's different from anything in Banjo-Pilot. I don't find it groundbreaking though, but I didn't find Banjo-Pilot's music groundbreaking either. None of the tracks have music programmed in yet, apparently. Also, the items are different. In Banjo-Pilot, the items are naturally based off items from the Banjo series, like the different types of eggs, the shoes, etc. (and they're ripoffs of Mario Kart items in my opinion). In Diddy Kong Pilot, they appear to be based off of items from Diddy Kong Racing, including some new ones like the peanuts (OK, I know they're from DK64, but still -- they weren't in DKR). This could have been cool. In addition, there appears to be a motion sensor feature (probably like Kirby Tilt 'n Tumble or Wario Ware: Twisted). No such feature exists in Banjo-Pilot, but I guess that it would have worked similarly to those games; you would tilt (or perhaps rotate) the Game Boy to steer your plane. Oh yeah, it has Redneck Kong (I think that's the name). Unfortunately, when he is selected, you play as Diddy Kong, so apparently he wasn't programmed in yet. Shame, I would have loved to see what he was like. So, yeah. That's Diddy Kong Pilot. If Microsoft hadn't bought Rare (and as more time goes on, the more annoyed I am at this due to games like this), this could have been better than the half-assed Banjo-Pilot, which despite the 5 or so years of development time, seemed lackluster when compared to both the Mario Kart series and the Banjo series. I remember being disappointed after a while when I got the game, as the race tracks seem uninspiring, there isn't much to do, and it doesn't feel like a Banjo game. Also, since when do planes slow down when they're flying over grass? 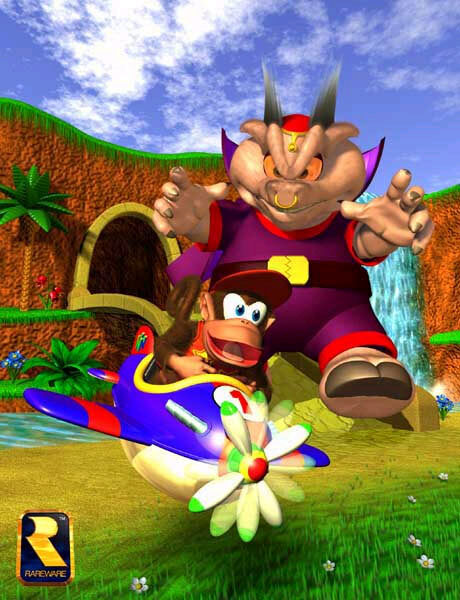 I do like how Diddy Kong Pilot feels like a Diddy Kong game, and if it were finished the way it was intended to be, I would have enjoyed it a lot. So, there you go. There's also supposed to be another video of a later build eventually, so that will be cool. OK, I'll end this post, since in typical fashion, this post was much longer than it was supposed to be. Last edited by Qyzbud on January 14th, 2013, 10:47 am, edited 3 times in total. Re: Diddy Kong Pilot beta footage!! In the story mode menu, the second option (Back to the Light) looks as if the game is attempting to display "Redneck" Kong's sprite, but it is garbled. When the option is selected, the voice incorrectly played for Cranky is heard again. This, along with the obvious thing in the character select, seems to show that he was in the process of replacing, or being replaced by, Candy Kong. (Candy can also be seen in the "Dog Fights" icon on the title screen). This just in the beta has been released to the public, but for obvious reasons I can't post a link to the rom sorry remember as Simion32 always says "Google is your friend"
I heard RWC webmaster Torrentstorm has this ROM now (not the 2003 one, the 2001 one). aperson98 wrote: This just in the beta has been released to the public, but for obvious reasons I can't post a link to the rom sorry remember as Simion32 always says "Google is your friend"
That's the 2003 build, not the 2001 build that this topic's about. I really am out of money so I really need to sell some stuff. If you've got a better offer on something then make that offer. 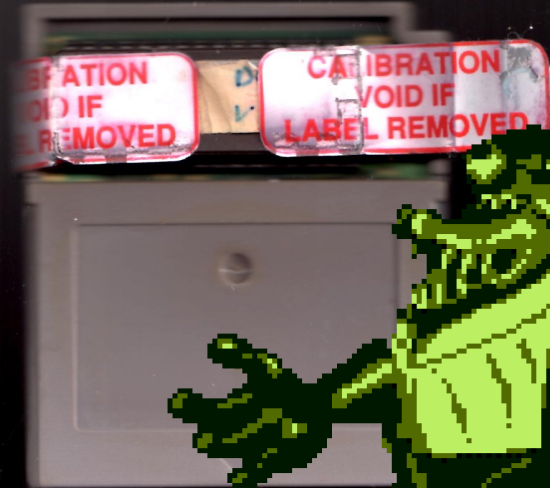 If he's that desperately in need of cash, why not offer the physical cartridge, too? This listing's going to get pulled real soon because selling ROM files in the forum's marketplace is against the rules. Interesting... Very interesting indeed. If it does get dumped, we can compare the differences. It's the ALPHA 2001 version, not the Pre-alpha 2001 version (the one with the leaked footage) from September 7. 2001. I'm the DKP Geek . Besides being earlier in development, what's the difference between the pre-alpha and alpha 2001 DKP? I'd love to play the version with the Mario characters. THIS BUILD HAS BECOME FAR IN DEVELOPMENT!!! I'd love to see if this ROM is ever dumped publically. This is bad timing for me because just a few days ago I purchased a very expensive game prototype (not DK-related). If he were offering the cart at this price instead, I might be able to sell the physicial copy after dumping to recoup funds. But if he's only offering the ROM file, I won't be able to do that. Don't get your hopes up, but I sent him a PM to see how much the cart would cost. I'd like to check this out, too, but I can't afford them all, sadly. A cheap hobby, this ain't. The seller says there is no cartridge to be sold, only the ROM, which was leaked to him by "someone at Nintendo." I'm going to have to pass. I think that's for the best, Mike. After all, Nintendo doesn't leak protos to the public or privately. Yeah, in this case it was always a ROM, not even cartridge format, dev emulator format. Diddy Kong Pilot is now sold. I hope whoever bought this decides to share the gaming love so you finally to get to play, Gaz. The ROM has been sold. But the who *crosses fingers that this person will share it*. His real name is Adam. He's a reseller who has sold several prototypes in the past (I've even purchased an SNES beta from him before). Chances are this game will be back up for sale soon in some shape or form. EDIT: Never mind, found out. I REALLY WANT THE ROM NOW. Disregard what I wrote earlier. The ROM will be released for free on Monday. Well that's amazing, unexpected news! I wonder what would possess a reseller to buy and release a ROM? It's a surprising decision, but a very welcome and appreciated one. Gaz is sure going to have a field day over this This will mean as much to him as the DKL3 prototype did to me. WOO!!!! YES! YES! YES! YES!!! . A ROM release. I cannot wait to compare it to the Spaceworld 2001 and Pre-Alpha 2001 versions! The ROM is now available for your downloading pleasure! I've confirmed that the game runs on VisualBoyAdvance. Go, Gaz! Grab it! The character select icons from the Spaceworld build, including the Mario characters!!! Oddly, I couldn't find Bowser's palette with the rest. Excuse me while I write up an Atlas news report. Re: Diddy Kong Pilot: 2001 Alpha has been Released!!! Cool stuff. Can't wait to try it. Well, I've had a bit of hands-on time with the alpha, and it does crash a bit (trying to play certain game modes, etc. ), but it is playable. Oh this looks neat hopefully I'll get time to play around with it more next week. Funny; I was just doing (basically) the same thing! Not a very exciting alpha course design, but the first one I ripped — so there you go. ...well these are a whole lot easier to 'create' than my DKC level maps! Last edited by Qyzbud on January 14th, 2013, 2:19 pm, edited 2 times in total. It's nice that this has finally been released to the public! I like this build better than the 2003 build, even though it is far from finished. It makes me wonder how this would have turned out if Rare just stuck to this and didn't completely revamp it (let's face it, even if it wasn't turned into Banjo-Pilot, I would have still found the 2003 build to be dull). One mission that I like (assuming it would have been finished) is the Hatch Match one; it reminds me of one of the battles in Diddy Kong Racing! I also wonder what Ghost Grasp was supposed to be. It crashes upon being selected on the battles menu, but you can choose what appears to be the battle in the debug menu (in Haunted 01). Even then, there doesn't seem to be a way to raise your score. Weird. 1. Open a version of VBA that can open .elf files (e.g. ones that are used for TASes). 2. Open the .elf ROM. 3. Go to Tools->Debug->Memory viewer. 4. A new window will open. Click the "Save..." button on bottom. 5. Another new window will open. In the address box, type 8000000. 6. In the size box, type 2000000. 7. A file save selection box will appear. Under "Save as type", choose "All files". 8. Next, choose a filename that ends in .gba. 9. Save it, and you will extract the entire uncompressed binary GBA ROM! This is useful if you want to open it in other emulators, or if you want to hack it with a hex editor. This method works because when a GBA game starts up, the ROM is always copied into RAM, starting at RAM offset 0x08000000. Note that this method probably results in a ROM file that is larger than it needs to be (the ROM may be smaller than 32MB, but I have no way to tell without trial and error), but it will still work even if it is too large -- it's just wasted space and causes no harm. EDIT: Apparently .elf files contain the source code and are a linkable format, and are not compressed files like I originally thought. Blame the fact that the .elf file size is not a power of 2. I fixed the errors so that I don't mislead people by accident. It appears to be a Linux specific format (executable and linkable format?). I've seen it mentioned/used on various GameCube hacking sites. There are sprites for the other angles you would see them from, but I don't have the patience (or time) to rip 372 more of these. Unfortunately, the graphics designer messed up on the Bowser and Yoshi sprites, as their brightest shades of green use the transparent color. The old character select screen sprites which go with the icons in my previous post. I like how Mario's plane looks like his go-kart and Yoshi rides on a Lakitu's cloud. What a broad spectrum of flying machines! I love that Funky is surfing... that's awesome. I'm impressed at the range of environments, too; beach, lava, snow, keep, lake, farm, haunted, jungle, swamp, desert... and they were in the process of designing four courses for each of those? Forty tracks across ten distinct areas is pretty impressive. This was going to be a pretty diverse game, it would seem. Awesome! The unused Mario sprites is in it! Awesome work Matt! I AM SO HAPPY ABOUT GETTING THE ROM ! BLESS YOU RETROGAMESUK! BLESS YOU! EDIT: I realized that this is actually the Pre-Alpha, given that it is identical to the Pre-Alpha footage. So, it's a Pre-Alpha. I wish the game was a bit more complete though, but that's just me. This is better than nothing. Also, Qyzbud, can I please make a seperate DKP 2001 topic about my theories, my comparison to the Spaceworld 2000/2001 versions and such? Also, I've changed donations from £ to $'s as some people emailed me about donating in $'s rather £'s, total amount raised: $10, every dollar helps! I look forward to seeing what else you all discover about the ROM! Man these are amazing! Anybody noticed that Bowser has similar look to his Mario RPG design, while Yoshi's design is similar to Yoshi's Story? @EvangeliKong: I did. Peach and Toad also look similar to their SMRPG models. Rare probably used whatever references were convenient at the time to build the models. ...the story mode pictures have been found and ripped, including some not seen in the video! I'm not sure if the opening door frames are positioned correctly, so I gave you the separate pieces if anyone thinks they can do a better job. In this list, kong refers Donkey Kong, krash is Krunch/Kritter, and red is...Redneck Kong! This reaffirms what is said in this DK Vine article. Redneck Kong appears to have been removed from the game already at this point, with the only trace being the aforementioned character selection image. Edit: Candy also wasn't implemented yet. Long lost rodent cousins of Tikis? Go to the Cheats menu and select "Cheat list..."
Input the portion of the code to the left of the colon into the "Address" box. Input the portion of the code to the right of the colon into the "Value" box. (Optional) Input a description of the code into the "Description" box. Click OK. The cheat you entered should now be on the cheat list, enabled. Repeat steps 2-7 for the other cheat codes. Click OK at the bottom of the Cheat list box to resume game play. The instant you begin a race, you should see D.K. If you've already started a race with a different character, he/she will instantly become D.K..
No problem. I did try a few values in each code beyond the first six or so, but found that they only resulted in garbled sprites, palettes used by other objects, and even game crashes (in the case of the voice modifier). The tool I used to find these graphics is TiledGGD. When using this tool, you essentially have to scour the ROM row by row. It takes lots of patience, as well as some knowledge of the formats that a particular console uses. The Game Boy Advance uses 15-bit BGR color palettes in little-endian byte order, just like the Super Nintendo. Sprites tend to be stored in 4-bit per pixel tiles/characters, but games sometimes use 8-bit per pixel tiles, or even linear/bitmap formats in 8bpp (as is the case for those story pictures) or 16bpp (non-indexed RGB images). I like not just the game, but those "Spaceworld" sprites! I can't wait till the impossible is done and all the sprites are ripped! Too bad Wario isn't in his Mario & Wario/Wario's Woods plane. Is there any other music hidden in the game? What seems to be promotional photos from Diddy Kong Racing. I found it in the Stories background. Isn't this interesting? What do you all think of this find? Here's the full title screen music. Good eyes, Gaz — I think you're right! What I think's funny is that on the right page of the book in that image... does anyone else think the illustration looks like a dark-skinned boxer with a bikini model's waist/legs? @Gaz: Nice observation! The similarities are uncanny. @Qyzbud: Not sure, but I think the pages in that book depict Mayan sculptures. The illustration on the left page appears to be a face of some sort. I can still see how you would interpret it that way, though. on the off chance you're not aware, since it's an elf, all the symbols are still in the rom. they haven't been stripped with objcopy. 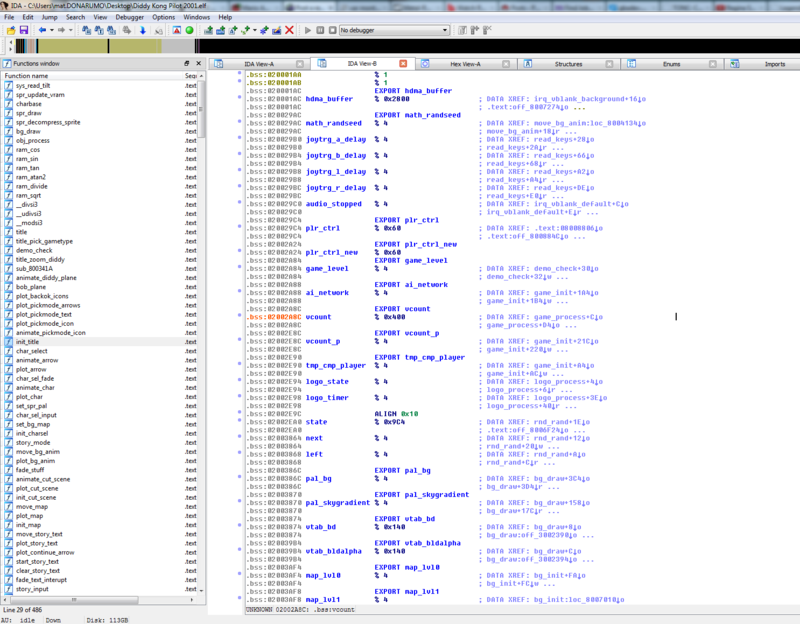 since that's the case, you can open the elf with IDA and view variable names and locations, segments, and the names of all the functions/routines, s/bss data, const data, etc in the rom. it's pretty handy. you can also dump the entire thing with objdump, i suppose, but it's more readable this way. warning: the .asm is absolutely gigantic. Okay, so here I will list differences between the two prototypes of Diddy Kong Pilot (2000/2001). I felt it was better to split this into a different topic as this is about the two different prototypes of Diddy Kong Pilot rather than the ROM release of the latter build. The September 7, 2001 build of Diddy Kong Pilot. The Spaceworld 2000 build of Diddy Kong Pilot. *The Spaceworld 2000 build calls the Racing mode "Tournament." This later was changed to "Racing." *Diddy's plane is positioned for its propellors to face the screen. *The "Diddy Kong Pilot" logo is smaller and has a slightly different font. The wings in the logo are also more pointed instead of round. More are to come. Help with this shall be appreciated though. Thanks for my role-model Blaziken257 for inspiring my work on finding beta differences on another recent topic. For the Spaceworld 2000 version, the title screen is different in every way possible. There are character icons that need to be selected in order for the character to be played as, instead of selecting an inanimate sprite of a Kong. The font has black outlining instead of green (applies for the menu text too.) Funky is playable in the prototype 2000 version. Doesn't seem like either 2001 build. Maybe he was an unlockable character during the game's development! Mario, Peach, Wario, Toad, Yoshi, and Bowser from the Mario universe are also playable. Comparing Spaceworld 2001 and September 7, 2001 builds, the font for the Spaceworld 2000 and 2001 builds are identical. The character selection arrow is red, instead of yellow with red outlining. There is also a circle above the reduced-size arrow with the number one above it, presumably to indicate player one. Cranky's pose is different from Spaceworld 2001 and the September 2001 builds. Candy was in process of replacing Redneck, but Redneck's highlight still happens when she's selected. The colored highlights of a character are not directly in front of the character, unlike the Spaceworld 2001 version. The characters have shadows in the Spaceworld 2001 version too. Weird how Spaceworld 2001's build appears to be more complete even if it is from like May 2001, compared to the full game's September 2001 build. In the Spaceworld 2000 version, only K. Rool's Gold is a story that can be selected and played. The story strangely doesn't work in the Pre-Alpha/September 2001 build. The story involves K. Rool going to El Dorado, and then a genie comes out to stop him from getting the treasure until he finishes certain tasks, starting with Crackpot Keep. Back to the Light and King of Kongs were added in the September 2001 build. When K. Rool's Gold is selected in the September 2001 build, the player is taken to Beach Barricade. Okay... I might update this post for more later or sometime... So much typing... This has been a report by DKP Geek Gaz .